Vincent and Tre Mason: If you're a four star recruit with a hip-hop pop, go oooh, oooh, ooh, ooh. 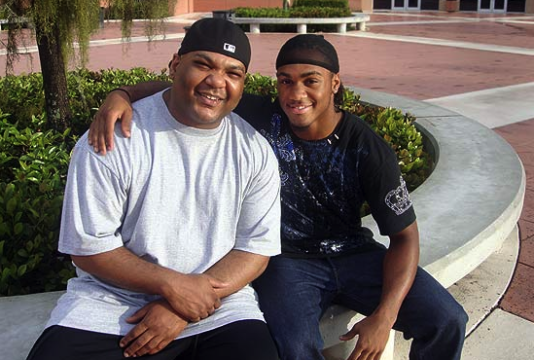 Auburn running back signee Tre Mason knows him as dad. The South Florida speedster graduates from Park Vista High School in Palm Springs on May 27 and plans to start class at Auburn a few weeks later. The week after DJ Maseo graduated from high school, he went on tour with LL Cool J, Slick Rick, and Big Daddy Kane. We talked with DJ Maseo on the morning of National Signing Day, a few hours after Tre, the second player from the 2011 recruiting class to fax Auburn his letter of intent, all but officially became an Auburn Tiger. The first thing we asked him was whether Tre listened to De La Soul in the locker room. Does Tre’s running match the style of Brent Fullwood or James Joseph as well as his taste in music? Daddy Maseo had no idea. So that was our next question: How much did he know about Auburn before the coaches came knocking and what did he think about Auburn once they started. Maseo said Auburn, more than any other school, gave him the guarantee he was looking for. He’s also apparently content with leaving his turntables at home on Saturdays; the last thing we asked him was if he’d lend his skills to Auburn’s pregame production — at least that laugh. It was nice of him to say, but we sensed his reluctance (breathe easy, T-Will). That’s what your signing day tweet was about? I thought you were just referencing quality old school rap for the heck of it. The DAISY Age is here! That’s cool. Best wishes Tre!